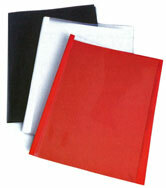 Advanced Document Systems & Supply is proud to offer an extensive selection of thermal binding covers. We provide black or white covers with a linen back and clear front. Each cover comes with glue in the spine so they are compatible with any type of thermal binding machine from the T100 Thermal Bind to the T80 Thermal Bind or even the TB450 Thermal Binder. Thermal Binding Systems and Supplies are a great way to add a more professional touch to your documents and presentations. They also work great for creating business proposals, manuals, and even school reports, cover sets, tax folders, and anything that will be bound for long term use. Below you will all the different sizes we carry from 1/16" thermal binding covers with an 18 sheet capacity to 1" thermal binding covers with a 260 sheet capacity. As you can see, we have a Thermal Binding Cover for all your needs. Advanced Document Systems and Supply is also an authorized dealer of the T100 Thermal Binder Machine, T80 Thermal Binder Machine, and T450 Thermal Binder Machine. Our Binding Machines can bind up to 700 sheets of 20lb bond paper and heat up in only 3 minutes! Check out our Thermal Binding Machine comparison chart for further details. Advanced Document System and Supply is here to provide you with quality products at affordable prices. If you have any further questions regarding our thermal binding covers and systems, please call one of our trained product specialists today! 1-800-808-2377.